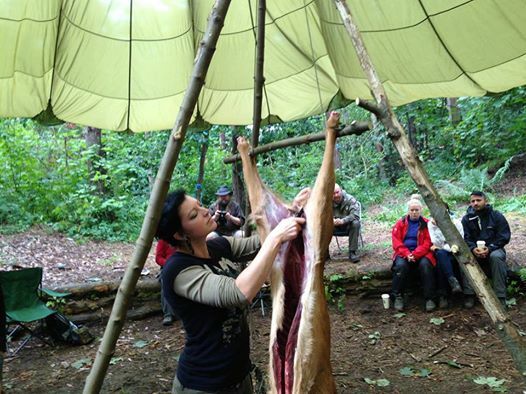 I am an avid practitioner of traditional living skills and primitive technology of all kinds and have followed this interest into the academic field of Experimental Archaeology, in which I hold an MA in Experimental Archaeology and a PhD on the ‘Microscopic Analysis of Prehistoric Tanning Technologies’ both from the University of Exeter. I have been tanning skins using traditional technologies for over 25 years. Coming originally from the state of Wyoming in the United States, I was lucky enough to grow up as part of a family of outdoor enthusiasts. This enthusiasm extended to hunting, fishing and trapping in the vast tracks of wilderness surrounding my home town. Learning to tan was a natural offshoot of the attempt to use as much of the animal as possible, and had the added bonus of producing a beautiful end product. Through much trial and error and with the support of very tolerant parents, I learned to brain tan skins between the age of 11 and 13. Later interaction with other traditional tanners and excellent written information vastly improved the efficiency and quality of my tanning process and end product. 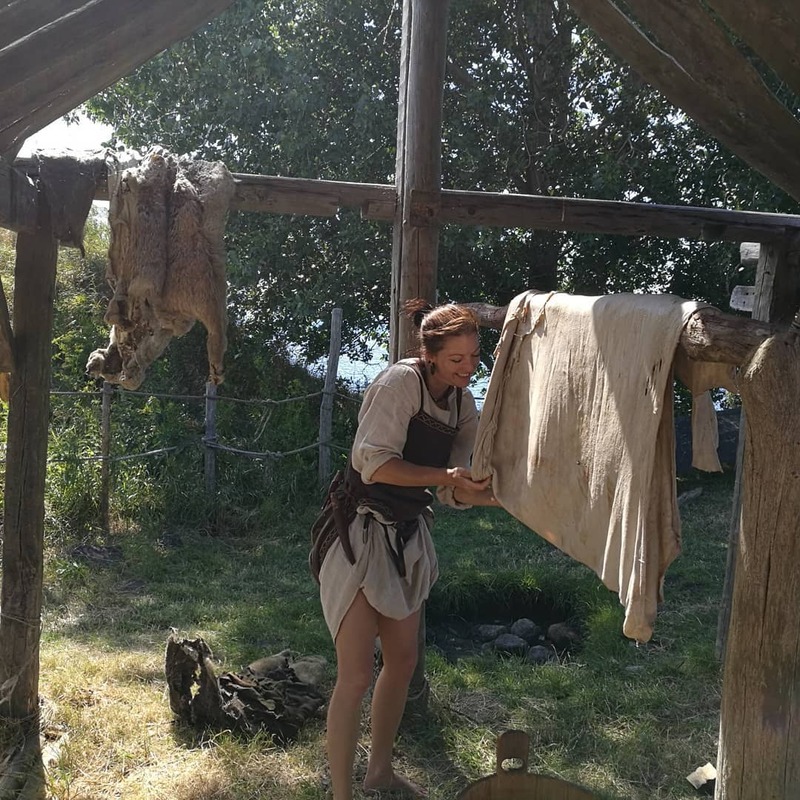 I have taught various tannage types such as fat tan, vegetable tan, alum taw and rawhide production to groups ranging from bush crafters to University students for the past eight years, drawing on my extensive personal and research experience to provide a broad understanding of the tanning process. I include in my instruction a diverse range of information, from skin morphology to helpful hints in dealing with the numerous and frustrating problems which are often encountered when first learning to tan (and often long after!). 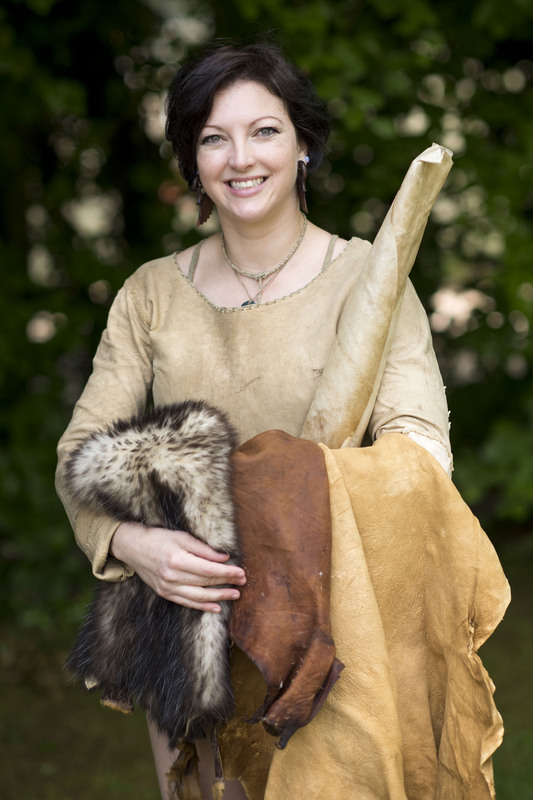 In addition to my main area of expertise in tanning technologies and skin garment construction and sewing, I have also taught and demonstrated a wide range of traditional living skills including; animal processing, the construction and use of traditional weapons, the use of plant and animal fibres, basketry, clay processing, pottery manufacture and firing, shelter construction and use, friction fire lighting and basic flint knapping and stone tool construction and use.